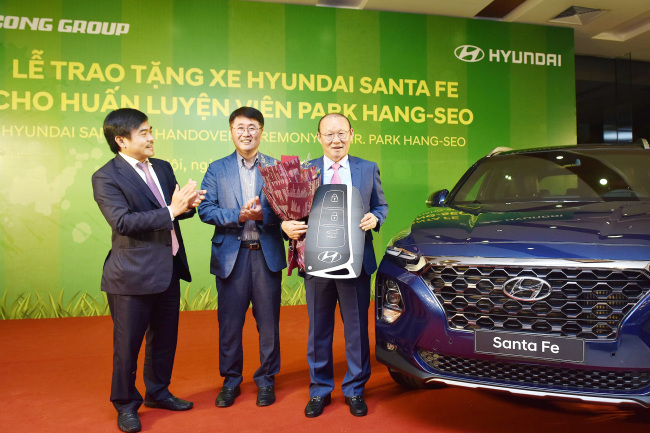 Hyundai Motor and local partner Thanh Cong Group in Vietnam have presented a Santa Fe to Park Hang-seo, the South Korean coach currently leading the Southeast Asian nation’s national football team. The SUV given to Park was assembled at a complete knock-down plant the two companies completed in a joint venture early this year. “We offer Santa Fe to Park Hang-seo who has given pride to Vietnamese people, so that he could do better,” a Hyundai official said. Santa Fe is one of the best-selling foreign vehicles in Vietnam, the company said, adding that it had sold around 1,185 units in the first quarter. The two companies signed a joint venture in January to set up a sales network capable of selling 100,000 units a year. The South Korean carmaker sold more than 50,000 units in Vietnam for the first time last year, taking a 19.4 percent market share. Hyundai is the second-largest carmaker by sales in Vietnam, after Toyota.